Researchers at the University of Illinois at Urbana-Champaign have created a powerful, tiny battery capable of safely being absorbed into the human body, the journal Nature is reporting. The battery is made of magnesium foil, saline solution, biodegradable polymers and other non-toxic materials. Scientists say it’s designed to power tiny biodegradable electronic sensors that could be implanted deep inside tissue or under bone. These sensors can wirelessly relay data about temperature or mechanical strain for about a day before being safely absorbed into the body. 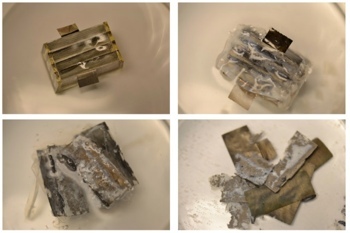 The University of Illinois researchers were not the first to design a biodegradable battery, but they may be the first to design a truly useful one. That's because it has an unusually high power density – an incredibly tiny battery with a surface area of 0.25 cm2 and a thickness of 1 micrometer could power a wireless sensor for up to a day.